Hi everyone! 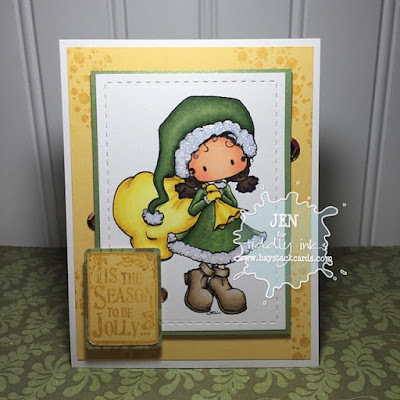 Tiddly Inks is back today with a new Holly Jolly challenge -- think greens and golds using your Christmas or holiday stamps. I used Faythe Gives for my design team project this week. I heat embossed some dots on the background and the grunge Christmas sentiment using Brilliance Galaxy Gold pigment ink. This is the only supply I have in my gold tone crafty stash. You see, I'm more of a silver than a gold kind of gal. But even I can agree that this pigment ink is divine!! The fur trimmings are dosed with diamond Stickles to add some sparkle and texture. Don't forget to checkout what the rest of the design team has in store for you today -- and link up your project too. I look forward to seeing what you come up with!! Thanks for stopping by! Really adorably little card. She is so sweet!! Glad you could join in with us on ARTastic. You rocked this challenge! Wonderful card! Thanks for sharing with us at ARTastic this month...cute card!!! Very cute! Thanks for sharing with us at ARTastic. Love the colors you used! Thanks for playing along at Artastic!